In previous blog CXF security: getting certificates from central PKI we have seen how to use Public Key Infrastructure and XKMS service to locate certificates in message encryption scenario. 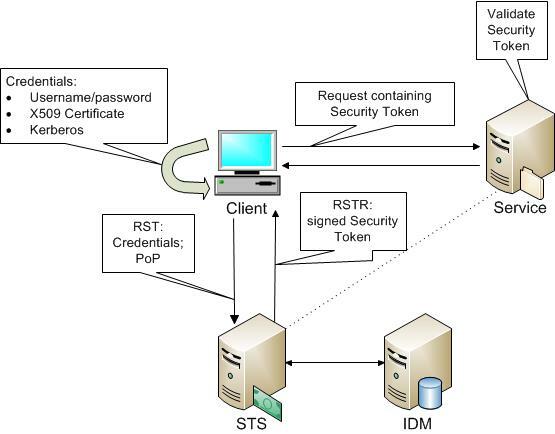 This blog is continuation of previous one and explains the integration of central PKI into SecurityTokenService (STS) for the authentication. In authentication scenarios client generates or obtains security token and sends it to the service for verification inside the message. Security token can be either user name and password, SAML assertion or Kerberos ticket. Generation of security token sometimes is non-trivial task, requires access to external systems and using third party libraries. Therefore it makes a lot of sense to free service participants from implementing any security processing logic on their own. This logic can be delegated to SecurityTokenService (STS) offering functionality to issue, validate, renew or remove Security Tokens.The STS is defined within the OASIS WS-Trust specification. Client obtains credentials and requests security token from STS. STS verifies credentials using external IDM or other mechanism. STS generates security token (for instance SAML), signs it with own private key and sends it back to client. Client injects security token into protocol security header (SOAP or REST HTTP) and sends request message to the service. Service extracts security token and validates it locally or using remote call to STS. As far as service and STS are in trusted relationship, it is enough just to validate STS signature of the security token. You can find more details about STS service in CXF WS-Trust documentation and Oli Wulff blog. Typically STS call is transparent for the client and triggered by appropriate WS-Policy assertion (IssuedToken). When STS validates user's X509 certificate? You can see that BinarySecurityToken has X509 type and contains user certificate. Timestamp is signed with KeyInfo referencing to this certificate URI="#X509-3CBA5F87FE6EAABD0E13661135280161". You can see that KeyIdentifier into Signature references SAML token ID="_C5CE27CE46751556E113662938382792". That means, the certificate from SAML SubjectConfirmation must be used to verify this signature. In both scenarios STS should validate the user certificate. STS validates client certificate using verifyTrust() method of WSS4J Crypto interface. Default implementation of Crypto interface is Merlin. Merlin provider is keystore based, that means, user certificate will be validated using local STS java keystore. Merlin checks first is user certificate itself in STS keystore. If yes, validation is successfully finished. If no, Merlin proves if keystore contains all trusted chain certificates. 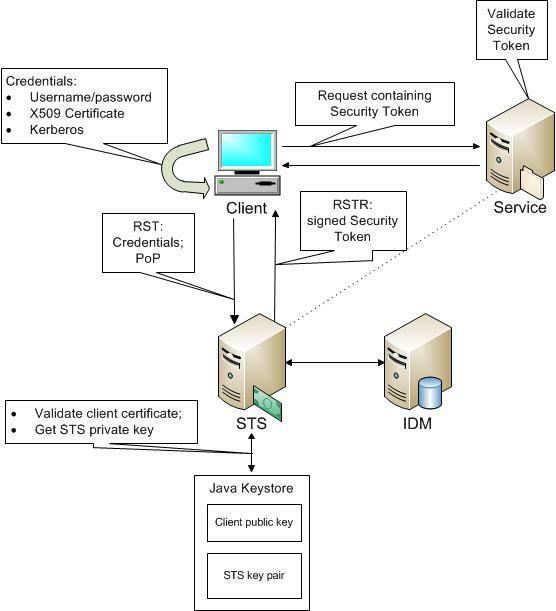 The problem in this approach is that STS local java keystore should contain either every client certificate or all certificates from certificate trusted chain. Furthermore, administrator should manage revocation lists for all client certificates in STS keystore. That is not really acceptable for enterprise environments hosting a lot of clients. One possibility to resolve this issue is using Crypto XKMS implementation accessing central Public Key Infrastructure (PKI) to validate user certificate. You can see that STS uses XKMS based Crypto implementation instead Merlin. XKMS Crypto still gets STS private key from local java keystore, but it uses central PKI to validate user certificates. W3C specifies standard SOAP interface to access and administrate keys remotely: XML Key Management Specification (XKMS 2.0). XKMS Crypto provider invokes XKMS service to validate user certificate. Dependent on XKMS service implementation, it either validates user certificate locally or delegates validation call to remote PKI. Administrator can manage certificates and revocation lists either directly in PKI or through XKMS registration interface (XKRSS). Note, that beginning from CXF 3.0.0, XKMS service and client implementation as well as XKMS Crypto Provider are available in CXF distribution. How to say STS that it must use XKMS Crypto Provider instead default keystore based one (Merlin)? The XKMS Crypto Provider should be instantiated and set as property either in StaticSTSProperties object or in STS jaxws:endpoint. That can be done either programmatic or via Spring/Blueprint configuration. The finished tutorial source code for STS configured with XKMS crypto provider is prepared on xkms_symmetric_tutorial. It is slightly modified code from Glen Mazza blog. jaxws:client is configuration of XKMS client, it is used as constructor argument of xkmsCryptoProviderFactory. Argument "/stsKeystore.properties" of xkmsCryptoProvider is necessary to create default keystore based crypto provider. It is responsible to get STS private key from the local keystore. 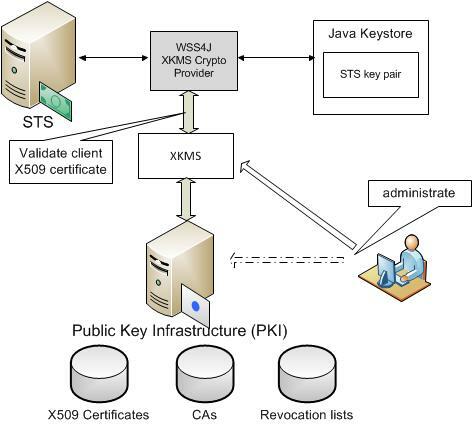 Lookup and validation of the public keys (X509) will be delegated to XKMS crypto provider and XKMS service. This feature can be especially useful for STS scenario with SymmetricKey. With this scenario, the STS and the WS consumer negotiate a symmetric key. The STS encrypts symmetric key using WS-Service public key and inserts the encrypted key together with security token into SAML assertion. The STS signs SAML assertion and sends it together with key material for generation symmetric key to the WS-Client. The WS-Service verifies the signature of the WS-Client (Holder-of-Key) with the decrypted symmetric key. In this way, the STS confirms that the Holder-of-Key is the subject (the user) in the assertion. The WS-Service uses the symmetric key to decrypt the message text. In this blog we have discussed use case and possible solution to use central certificates management infrastructure inside Security Token Service (STS) to validate and locate X509 certificates.